The adventure in Adventureland comes from the idea of visiting exotic locales and doing interesting things. Cruising down the Amazon, climbing a giant tropical tree, flying through Arabia on a magic carpet, taking a relaxing cruise through a Caribbean village during a pirate attack. Over the years the theming at Adventureland was primarily tropical with just hints of other locations. This changed in 2001 with the addition of the explicitly Arabian Magic Carpets of Aladdin attraction, which creates a bit of an abrupt transition between somewhat contradictory themes. 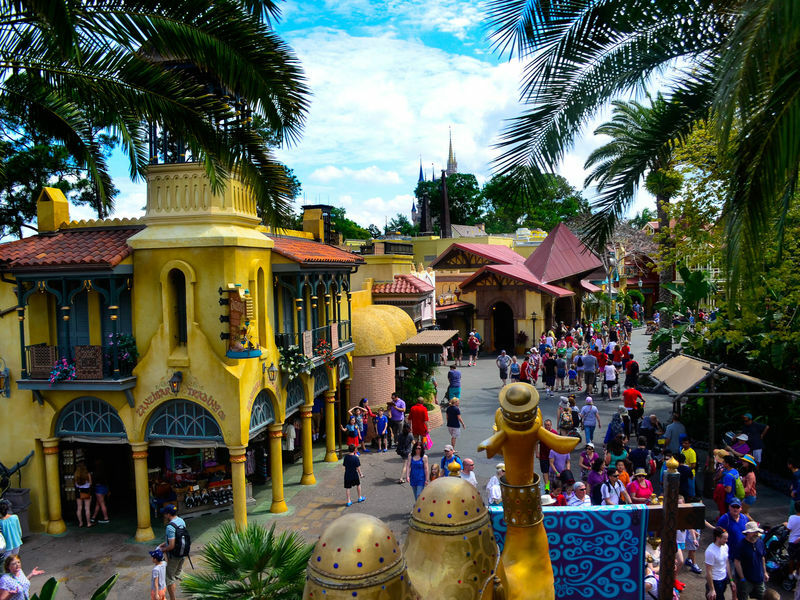 Except for that attraction, which is similar to others found around Walt Disney World and most theme parks, each Adventureland attraction highlights what can separate Disney from any other theme park. Location: The southwest corner of the park. Jungle Cruise Travel the rivers of the world and experience scenes from those environments. Pirates of the Caribbean Float through a pirate attack on a Caribbean town. Swiss Family Treehouse Climb this large artificial tree and see the story from the 1960 movie. The Magic Carpets of Aladdin Take a magic carpet ride. Walt Disney's Enchanted Tiki Room Where the birds sing words and the flowers croon. Aloha Isle Walt Disney World's version of Dole Whip and floats. Sunshine Tree Terrace Lunch entrees, soft-serve ice cream and citrus swirl. Tortuga Tavern Counter service sandwiches and salads. Agrabah Bazaar Arabic souvenirs and Aladdin related merchandise. House of Treasure The Pirates of the Caribbean gift shop. Island Supply Tropical clothing and other Pacific-related merchandise. At this location: Adventureland is an original land at Magic Kingdom. The only expansion was for the addition of Pirates of the Caribbean in 1973, which required a show building that extended beyond the original extent of Adventureland. 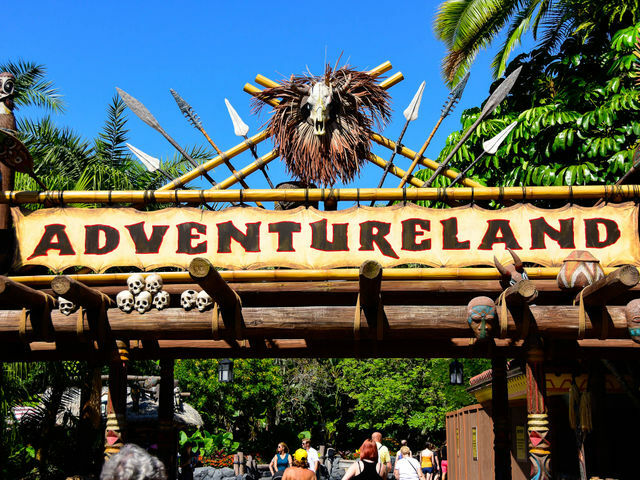 The Land's History: When the park opened in 1971, Adventureland had three attractions, all of which still exist today: Jungle Cruise, Tropical Serenade (since updated and renamed), and Swiss Family Treehouse. Early visitors frequently expressed disappointment that Pirates of the Caribbean had not been included in the park, so it was put on the fast track and an abbreviated version of the Disneyland attraction opened in 1973, beefing up that area of Adventureland with new stores and the El Pirata y El Perico Restaurant. For the next 25 years, Adventureland remained essentially unchanged, though various entertainers and stores came and went over the years. In 1992, a new exit to Frontierland, near Pirates of the Caribbean, was opened to ease traffic around the new Splash Mountain ride. Then in 1998 Tropical Serenade closed for refurbishment, received an updated script and reopened as The Enchanted Tiki Room�Under New Management. It wasn't until 2001, with The Magic Carpets of Aladdin, that Adventureland received its next new ride after the opening of Pirates of the Caribbean in 1973.